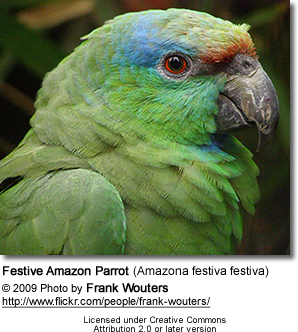 The natural range of the Festive Amazon Parrot (Amazona festiva festiva) stretches from eastern Ecuador, Peru and southeast Colombia east to Amazon basin, and as far as lower Rio Madeira. A breeding pair averages 3 eggs in each clutch and the incubation period is usually about 28 days. Natural Range: Found near the Orinoco River. 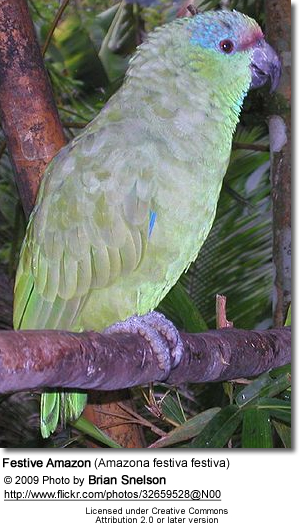 This parrot averages 13.5 ins (34 cm) in length, from head to tail. 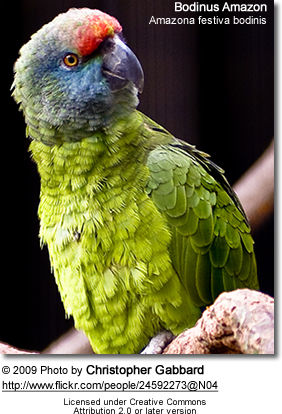 The plumage of this parrot is generally green; although the nape feathers are faintly edged with black and the flight feathers are edged yellowish-green. It has a narrow dark red band to forehead and lores (the regions between the eyes and bill on the side of a bird's head). The area above the eye and chin are blue, and the cheeks are yellow-green. The lower back is scarlet. The primary wing feathers and primaries (= longest wing feathers) are violet-blue. The tail is green with greenish-yellow tips. The feet are grey, the bill grey and the irises orange-red. Immatures have dark irises and display a less intense color to the head. 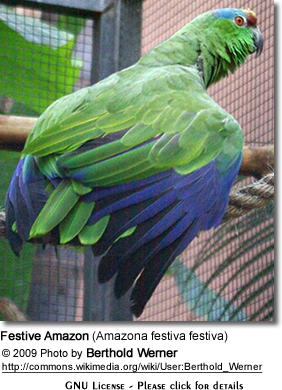 Their lower back is virtually green; some of the outer tail-feathers have a red base. The subspecies bodini has more red to the forecrown and more blue to the face than the nominate. In flight, both subspecies show deep blue outer wings (outer webs of the primaries (= longest wing feathers) and the primary coverts and a red rump, but the latter is reduced in juveniles.